I thought the same thing when I first saw these pieces but now I own several all with the odd buttons, even though Geoffrey offered to change them for me. I think that you really have to see the buttons up close and listen to Geoffrey’s explanation of each one. Literally every button has its own story and it fits with the history of the jacket. For me they are an integral part now. I wouldn't dream of changing them just as I wouldn't dream of buying a jacket with odd coloured buttons from anyone but Geoffrey. I think sometimes you have to sacrifice a little of your aesthetic in order to gain a little soul. Geoffrey, tell 'em about the buttons, my friend. way-hey! thanks Mike and Faust - i got more options now. Hello again, I think we have worked out the image posting technique. However, we are trying to provide you with a very thorough and complete overview of our design approach in regards to the button discussion and are discovering that there are character and image limits set for a single thread reply. Our feeling is that if we are going to participate seriously in a real design discussion, we do not wish to compromise on the completeness of our information and contributions to the discussion, so please bear with us as we must now re-edit our reply text and images in a manner that will work with the existing reply format limits. Sorry, thank you again for your kindness and patience. We shall wait :-) Also, you can always host images elsewhere and just provide links here. Of course it's cool for our forum to have these images presented here. Last edited by random; 09-06-2009 at 01:57 AM. Ok, we have worked out the technical problems involving image-posting and limits, thanks to all for their help and patience. Please note we have purposely avoided divulging images of our recent work online now for many years due to extensive copying by industry competitors. Our presentations have been closed to industry press and photographers since 2001, and we do not post any of our recent collections in detail on our public sites. I therefore agree to provide SZ with some images for the thread based in good faith that they will be utilized solely for the intent and purpose of design discussion and clarifications as per the stated mission of SZ. However, we are aware that many designers, retailers and industry players are now watching SZ carefully, so if we discover any abuse of the information we provide to SZ, we will need to drop out immediately and abstain from continuing our participation. Hopefully, this will not be the case. Sorry, but we work in very tough business and are still around to say so. I hope everyone understands. That said, I will now continue with some issues regarding the current thread about my work and yes, buttons. I am sorry about the length, but I wish to do a thorough and complete explanation as my time available to be online with SZ is limited, I have production and deliveries to do, and a new collection to develop and show in Paris in under a month. First, the real medium we are working with is the clothes, not images. And the clothes we are making are really very special and need to be seen and touched in person to really get any understanding of them. I find it is very risky and compromising at the least, to be talking about and making design judgments about clothing solely from sparse and often very poor images online. In the end, you have to smell, taste, chew, feel, swallow and digest the food to understand what it really is. And looking only at pictures when it comes to really high-level stuff, is nothing short of ridiculous. In fact, some of the most beautiful images of food you can find, sit on the outside of packages or cans of some the worst products you can ever put in your body. Nice images take time, talent, skill and usually lots of money to produce (these types of skills don't come for free). So it falls in line with large industrial companies who have the volume and resources to blow money on photographers and images (instead of food quality) to come up with beautiful pics. The rare, really educated customer, knows better and avoids the smokescreen. The vast majority however, are fooled, and proceed to buy the sh..., and eat it. You can eat packaged food, McDonald's etc. often beautifully photographed and well publicized, or you can eat a really good home-cooked meal made perhaps by your grandmother or mom which has no publicity... I think we can all agree, there is a difference in both quality, value, and experience. Bear in mind, that next to food, nothing is more personal than your clothes. They are the only things that touch your skin and body all day long, all your life. For mlllenia, they have been the fundamental protection for your body from the elements and environment around you, and they have served always to determine your position, role and influence in the community and society around you as well. Early in my career, I was hit by the sheer brutality of how much our society has devalued the work it takes to make a good piece of clothes. But it was only up until about 160 years ago that we did not have our clothes made specifically for us. Prior to the industrial revolution, for thousands of years going all the way back to the neolithic stone age period, people always had their clothes "made for them." They were made by a tailor, or your mother, or someone who had the responsibility to make what oftentimes was your first and only defense against the outside elements--and often with a goal to make something that would last a lifetime, or even two, of wear. Intense amounts of care and even love, in addition to toil, blood, sweat and tears went into the single garment, for the single person, that would last a lifetime. And the person that created that garment was a far more esteemed member of the community than his or her equivalent today. If he or she did their job well, it may well save your life. The old english saying "my tailor is rich" did not arrive without having its many true examples. Yet a "tailor" or a "stitcher" or a "seamstress" in 1979 when I started out, and still today, is deemed as 3rd-World work, valued at less than 5 dollars a day. Something to be done by "someone else" somewhere else, probably without papers, for as little money as possible. In the meantime, customers have no idea who made, and what went into, the clothes they buy and wear. Workers who make the clothes have no idea who is going to wear their work and what their real needs are. The industrial revolution has entirely ripped out the human aspect and personal connection from clothing, and as such, totally devalued and degraded the entire thing. And when you take out the personal connection, the quality immediately drops--because the personal responsibility and reward feedback loop is gone. The people who make the clothes never make the entire product by themselves, and they never see or know the person who has to pay for, wear, and use the clothes. So, it is easier to "let a few things slip" here and there. This is the industrial system. Somehow, I have ended up spending the last thirty years of my working life trying to survive this phenomenon, and now find myself uniquely prepared as we enter a paradigm shift in everything we do on the planet, including how we will dress ourselves. By nature, our clothes are designed to be different than others. We believe that everybody wears clothes and that people talk with their clothes, saying who they are and who they want to be. The extremely competitive and tough global business we have been in now for the past 30 years has forced us to find niches where we have been able to maximize our strengths as a tiny, independent artistic house with technique and passion, in order to survive in a land of commercial and industrial giants who have been steadily eroding our ability to exist. One of these niches is to design for the individual who does not want, or need, to conform and dress like "everybody else"
These people are few but very smart, and of course, very good dressers. They are also the people who have the courage and intelligence to be first in their groups, and followed by others. Leaders. For over thirty years, this has been our primary customer, and we have been committed to serving that customer in everything we do. We are a true research house, having initiated hundreds of approaches, techniques and trends that have been adopted by the rest of the industry from so-called "cutting-edge" and "artisan" designers, to mega-designer brands like LVMH and Dolce & Gabbana, to H&M. Most of you don't know about it, because the industry doesn't want you to know about it for obvious reasons. And for decades, the industry has totally controlled the information that has been available to you. Fashion companies, generally stopped paying for research over ten years ago, they found that it was cheaper and easier to steal it. As a result much has been degraded and sadly, although I have paid a very high price myself, many many of my talented and dedicated colleagues have been pushed out of the game, including Maurizio Altieri. A large part of my own story, is how one independent research designer has been able to continue to survive in this really difficult environment. One key is reducing distribution and quantity. For example, CDG works with about 500 retail points worldwide a season, Rick Owens is now at about 300, Carpe Diem in its heyday, between 30 to 40. I prefer to work with less than 10. The people in Italy near me who own 100 percent of Martin Margiela are often dissatisfied with the number of production pieces per model (NPPM) of the MMM collections, which at one time averaged 150 NPPM a season. Their production system and economics generally needed 300 NPPM a season. That's 300 pieces of one design, usually in one fabric, for one season, in the world. The CDG, and Junya main collections target average is around 30-60 NPPM a season. My average NPPM per season for the world is less than 5. Ours is a completely different product, approach and concept. Different than what most people know about or understand...we are not making an industrial product. They are. Even at 30 NPPM. Whatever the "artisan-made" hype-- they are producing using industrial sub-contractors, methods, materials, treatments and technologies...and often the very same resources, materials, processes and even patterns used by their competitors. Their interest and ability to change, adapt, innovate and serve the customer who does not want to be like anyone else is vastly different than ours. Their economics are also very different. They need critical volumes of business to maintain much larger structures of people, overheads, production minimums, and marketing to stay alive. As such, they need to compromise in every area that we do not. This is part of the massive paradigm shift which began in 2008. We are at the end of the industrial age, and the beginning of something very, very different. Over the years, our job has been increasingly to develop and create designs that no one else is doing or has done before. To present to buyers who on average see over 500 top international collections per season, something that they have not seen somewhere else before, is not an easy task. But it has become absolutely necessary for us to sell any work and create a viable place for us to continue to participate in the field. As such, every single aspect and element of our designs must be thoroughly researched in an effort to continuously push the envelope of what can be done and what can be possible. Even what normally is viewed as something as mundane as a button, when viewed by a serious artist of the metier, is in fact, a critical visual element and indicator of quality and value, on a garment. A serious connoisseur (that's our customer) can immediately spot a good button and a bad one, and determine the difference in the total quality of the garment and attention that went into designing and making it. If we use an analogy of automobiles, my goal is not to make a BMW or Mercedes. I am instead focused on making a Ferrari, or better yet, a Koenigsegg. The most advanced, beautiful, handmade pieces of clothing humanely possibly in the world today--capable of delivering the most outstanding performance: aesthetic, wearing and financial, bar none--with the additional caveat of creating a new leading model of environmental, ethical and economic sustainability for the industry. environmentally- it's a loser, primarlly due to the processes of both the making and disposing of the articles.... plastic requires all sorts of nasty petrochemicals to form and color the product, then ends up in landfills like all poly and synthetic materials, fibres and components, and like all plastics--does not degrade for centuries creating its entire subset of problems including water table runoff disruption and dangerous new malaria growth. There is also increasing scientific theory that many of our growing cancer-related diseases are resulting from our constant exposure to petrochemical plastics in all aspects of our environment. For example, plastic water bottles can only be used once, since the plastic is porous and attracts bacteria. If you refill it, the bacteria and possibly additional carcinogens from the plastic seep into the water that will go into your stomach if you drink it. How many times do you touch your plastic buttons with your fingers? Quite a lot if you need to get in and out of your clothes. Maybe sounds silly to some, but we think about these things. Again, we know a lot of our customers personally, and we care. In 2002, we started to eliminate and reduce the amount of new plastic buttons in our designs. First, we embarked immediately on one of our fundamental areas of expertise: recycling, and began to use carefully selected vintage and old recycled buttons. The very nature of using recycled buttons forced us into having to use different buttons all the time on each piece. To make the pieces look great, I had to oversee and make a different design of button combinations for every single piece we produced. Like drawing a picture or painting a landscape, composition and color relationships and combinations were absolutely critical for the end result. The time and work were tremendous, but the results were beautiful. Every piece had its very own vintage button story, and the pieces sold-out very well for our retail store partners. Within a few seasons, similar interpretations started appearing on more publicized avant-garde collections including Jun Takahashi's Undercover and others. button stories soon appeared or re-appeared in many Japanese collections. We also hand painted vintage buttons with quite good results. 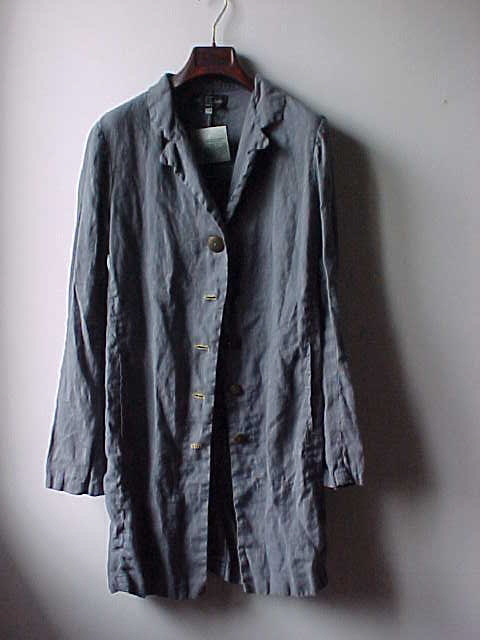 Here above, an example of a hand dyed pure linen duster with handpainted button story that we presented very successfully in Paris in October 2004. Working with this medium, we became exposed to a new world of possibilities when it came to buttons. Some of the vintage pieces we found were stunning, exhibiting levels of artistic beauty, workmanship and material quality unseen in at least 2 or 3 decades of industrial designer fashion. I could not help but begin to think that we were missing an entire metier of creativity in our industry that some time ago formed a serious and personalized part of a person's clothes. Further research during our landmark Napoleonic-period collection development introduced us to museum collections of 18th and 19th century garments still intact, where we were able to see stunning examples of incredible artistry in button design and work, leading us to really rethink about the importance of this part of garment design. While many of these button concepts are still beyond our technical and economic capacity to even try to recreate at present time and labor costs, some more simpler forms were reproduced in our workrooms for our collections. Here above, double hand covered buttons in Italian black wool jersey (Prato) and natural undyed Venetian pure cotton lace on an authentic reproduction pattern 1778 frock coat that we first developed in late 2005. The design requires no less than 27 of the handmade buttons to complete and has been a very successful selling piece for us in super limited quantities. Above, a 19th century made to measure bespoke waistcoat made for Dutch hair designer Jan Fuite in collaboration with Koos Fabre at Nuzyn Amsterdam based upon our MMJ5 model from the January 2006 Toussaint Louverture collection, with 13 hand covered buttons and handstitched buttonholes. The piece was specially triple hand dyed to achieve its very unique mottled patina effect on the heavy brushed pure cotton denim cloth woven for us in Varese, Italy. At the same time, we began becoming concerned that after finding and using several thousand beautiful vintage buttons, we were having increasing difficulty finding more. Our research led us to discover several of Europe's best artisan button-makers still operating. One is the world leader in Tyrolean-style buttons, a two generation family business working near Freiburg in Germany, another we discovered during our medieval-period collections period (2006-2008)- an expert medieval historical craftsman in Siena who hand casts amazing authentic metal design reproductions from the 8th to the 16th century, and a third who has become one of our closest collaborators...a 3-generation family firm working near Parma who are probably the world's best artisan button-makers still active today. Each one of these resources is a creative and technical master in their own right practicing in an artistic metier that is a world unto its own. A rare and beautiful button of unusual make and material is like a piece of jewelry. As we continuously search to make our designs more unique, special, and personalized, buttons have indeed become an integral part of our fundamental design elements. Each one is a work of Art, playing its own key visual and tactile role in the total composition of our pieces. We spend more for our buttons, than most designers spend for their main fabrics. To us, it's a serious part of our Art." Whether specially made for us by Italy's best artisan makers in Parma, Siena or Padova, or hand picked from dozens of the best vintage and antique suppliers in Europe, or actually refinished, modified or created and made by hand in our own studios, the average cost per button on our clothing now reaches over five euros a piece, wholesale, with many clothing designs having between 50-100 euros worth of buttons sewn into them alone. Add to that, the incredible amounts of time that such a complex and intense approach, in both design decisions and production efficiency, to a detail that normally is just done with all the same buttons, and the costs go into the stratosphere. Our production goes very slow when it comes to button operations- because visually and functionally it's so critical to achieving our vision of a piece's maximum potential. Above: the very special buttons on Hobo's 2006 PFJ04 are actually not colored at all. They are uncolored- in their totally natural state, hand cut and made for us in Padova, Italy, in real mother-of-pearl, each one unique and beautifully formed by nature, fully bio-degradable with no dyes or chemical applications, and financially about 10-11 times more valuable than typical plastic ones, making Hobo's already very special jacket, even more special, and an even better value-for-money. Snapshot of a collector's item: only 11 handmade pieces of this super limited edition jacket have been made for the entire world since July 2006. Hobo owns one of them, and its unique button story is one of the primary design features that makes it unlike any other jacket of its kind available in the world today. IN PERSON, when someone sees the jacket on the wearer (in this case, Hobo), they will subtly notice that none of the buttons are the same and upon closer inspection, the buttons are of a uniquely cool and beautiful character, leading one to ask what kind of jacket is that? Who made it? And of course, what kind of person is wearing it? Clearly someone who is different. Who thinks apart. Who knows something more. Again, this is our customer. The smart one. The one who thinks, who knows, who does his research thoroughly, and then leads the way. Even when it comes to buttons. Intelligent, knowledgable people who truly know clothing design and value, (our customer) know the difference. What other people think... "they like it, they don't like it"...doesn't matter to me. That's their issue. Their problem. My job is to deliver to my customer the very best that I know is possible, each and every time. And I know what is possible much more than the customer does. That's my job. 24/7 for 30 years. No watering down. No compromises. Simply put, my customer does something else for a living; and he or she is usually very good at it and knows it far better than me, that's how they can afford to buy my work. They do their job. I do mine. And beautiful things happen. To maintain this standard, we cannot put out any design that hints at mediocrity or sameness. Again, our work cannot be for everybody. It is for the real purist. Not the fake ones trying to pass as real ones. Many of our best customers are not even the designer store shoppers, but the staff people, managers, and owners--professionals who see thousands of pieces of clothing a season from the world's "hottest" labels. For us, it is always a great honor to have our work selected by one of these experts for their own personal wardrobes, and we are thankful, and committed to making it worth their hard-earned money every time. hours of button and buttonhole operations work from preparation to completion per jacket. by hand, and 3rd button in light horn crust cut in a saturn bowl shape. story combination was specifically developed for the right sleeve (above). each, at Harajuku (Tokyo), Shinsaibashi (Osaka), Kyoto, and Okayama stores. and COO of the MinorityRev stores in Fukuoka Japan. The superlux GJ04 collector's item jacket was cut from a fabric made by the oldest wool mill in the world that costs well over 120 euros a meter before even a single cut is made. With almost 2 meters required to build one piece, the jacket has well over 230 euros in wholesale external fabric cost and built-in value alone, without a single stitch. While we take our buttons very seriously, we take our fabrics perhaps even more so. Buttons and fabrics are a few of the many critical elements that go into our unique work at Cavarzere Venezia and the creation of some of the most exclusive hand made pieces of designer clothing in the world today. If there is still interest among the SZ membership after reviewing this material, I can try to prepare some more insights, images and overviews on fabric, and explore some of the other key elements and aspects of the work we are doing. Again, time permitting...let me know. In any case, thank you all very much for reading. I hope it was of some fun and interest for all. without doubt the most satisfying and rewarding fashion read in recent memory. Dear mr Small, you really made my day. I haven't read such a testimony of absolute commitment for a very long time. I can hardly wait to read some more from you ! It was indeed an interesting and thoughtful read. I have always respected your work and have now, a newfound respect for it because of this post, even though i disagree with some of the things you said. It is possible to do these things - although it will depend on the jurisdiction as to how it works. In the UK for example copyright arises automatically as soon as an image is commited to a form of physical medium. However it's just a right that protects the image itself from being copied - it's of pretty limited use, when, as you say, the "idea" might be apparent and exploitable without literal copying. Ideas generally can only be protected if they embody something "new" (which as a matter of principle must be right). It's interesting though. A I read GBS, the focus is very much on the fabric and the detailing, and in particular the process. If the materials and the process are so rare - and it's this that creates the value in the garment - I can't see how copying is an issue. Indeed, it must be almost impossible to copy these things. Or maybe this - or past instances of copying - is what has lead GBS down this highly artisanal path? Even if the process can't be copied, a copier might mimic the idea--or the aesthetic result-- of that process. For example, what if someone sticks a bunch of mass manufactured and mismatched buttons on a sweater? In this instance, the process and the idea are divorced and the result is thereby *impoverished (as the critical or trained eye can see, but not, one might argue, the average consumer). **Impoverished because the ideas behind the original (Geoffrey's garments) and the process of making them are utterly inextricable (it seems to me). Thanks very much for that. I haven't actually read the post yet as I'm going to take my time over it, one evening, however it seems pretty conclusive that the folks here are into your way of doing things.